The folks at Artison know that if you make an investment in a quality product, you want to keep it that way. 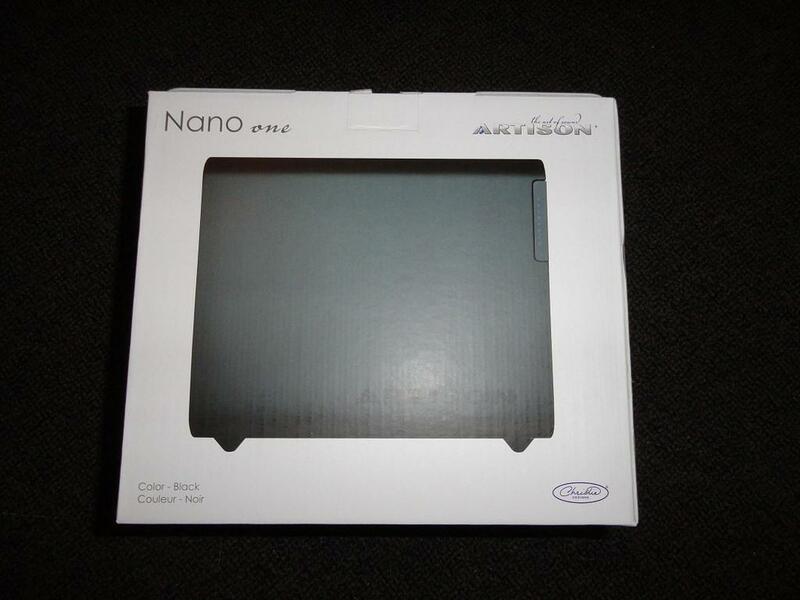 The Artison Nano 1 came packaged in multiple layers, starting with the shipping box, retail box, interior foam packing, cloth-like bag, cardboard wrap and finally a plastic bag. 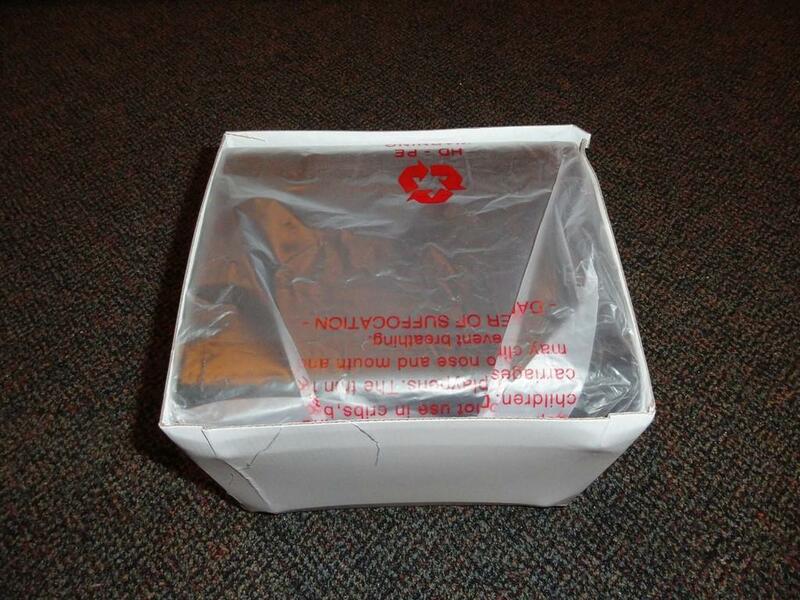 While that may seem excessive, with an $899 MSRP, you should expect this kind of attention to detail from any company. 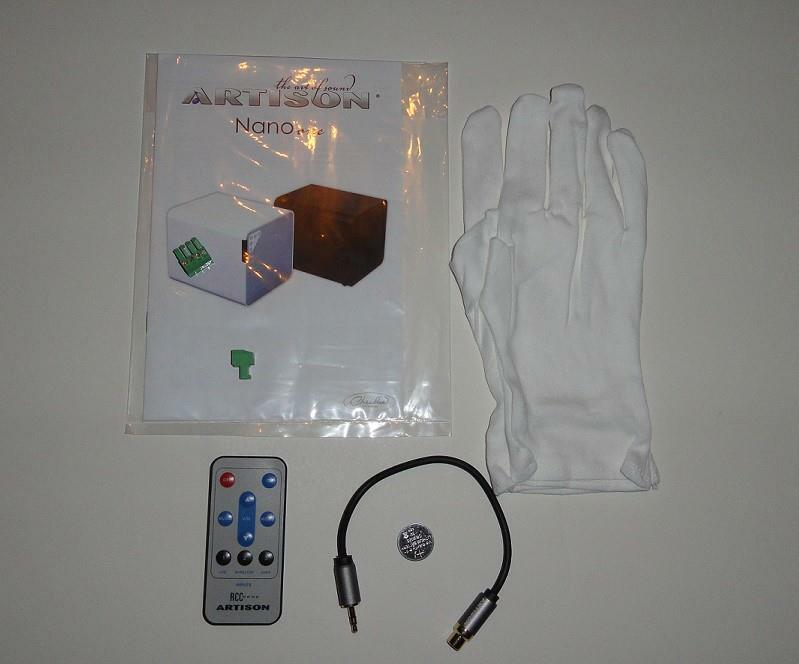 In addition to the sub, the Nano 1 box includes the instructions, mini-jack to sub out adapter, remote, battery and not surprisingly, soft white gloves for handling the unit. The first thing about the Nano 1 that will catch your attention is the size. 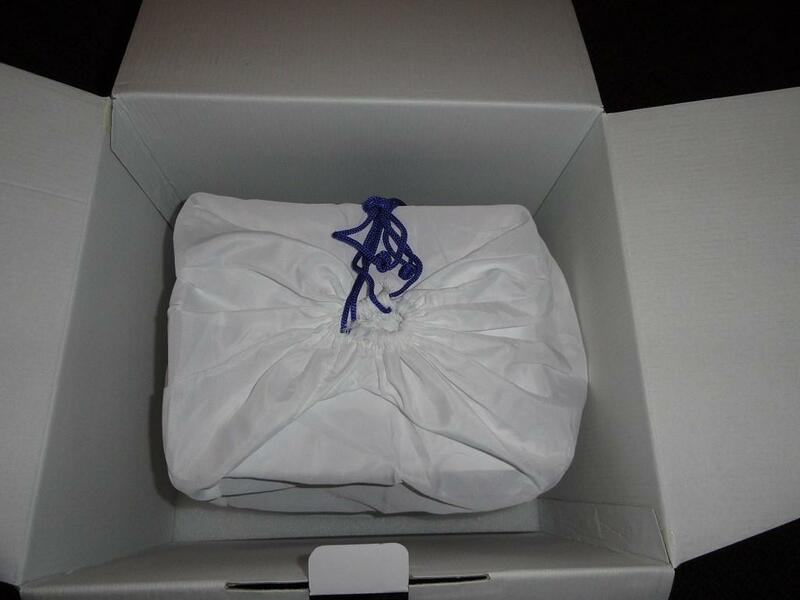 It is no larger than nine inches on any one side and is very clean in its appearance. The finish of the sub is done in black aluminum, while the ends are both covered in grill cloth (not removable). 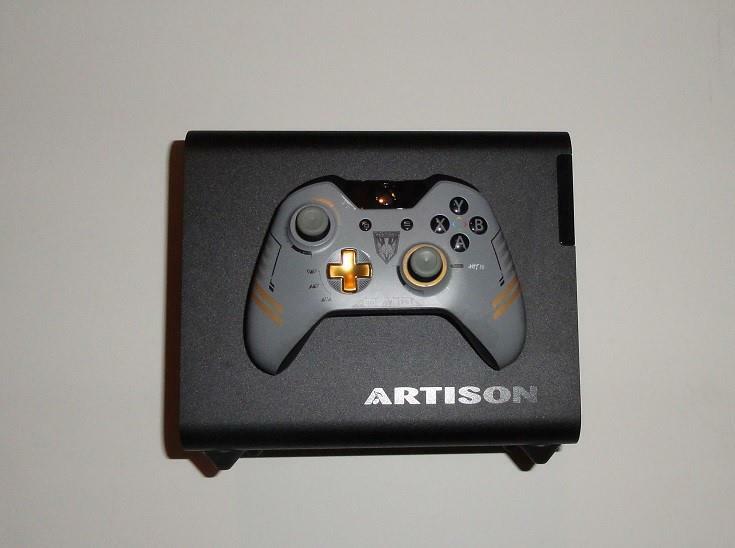 The front has a small control section in the upper left that has the buttons for power, volume, input and audio mode and the one side has the Artison logo on it and the display area for the LED lights showing input and power. The bottom contains four rubber feet as well as the plate for all of the inputs and most of the audio adjustment controls. When compared to an Xbox One controller in the image below, you really get a sense of just how small this subwoofer is. However, don’t let the size and sleekness fool you and this little beauty packs a punch especially when it is placed accordingly to maximize its acoustics. The remote for the Nano 1 is credit card sized and pretty basic in its controls. It has buttons for power, volume control, input control and music or movie sound options. These button functions are also duplicated on the Nano 1 chassis itself, so if your remote gets lost, broken or batteries run out, you can still adjust your control options. 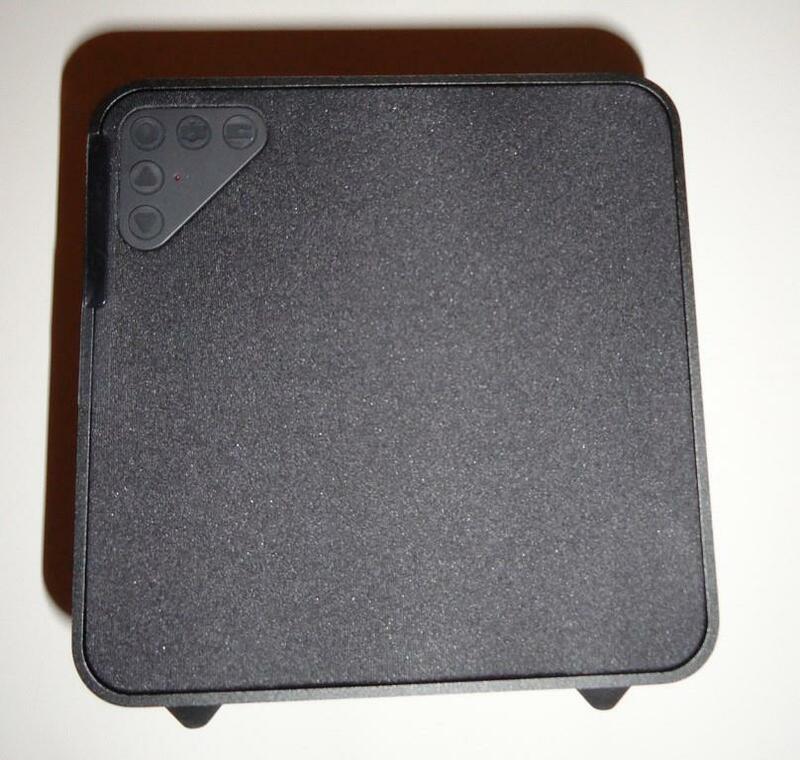 The Nano 1 is a smallish sub that looks like you should be able to pull it form the box, plug it in and away you go. And while this is absolutely true, the reality is that there exists enormous bass potential under the hood and Artison has included the ability to connect and tune the sub to whatever you prefer. I personally went with the low level input utilizing the 3.5 mm jack and a sub cable from my Onkyo receiver. In addition, I adjusted the Low Pass filter (60-160 Hz) toward the bottom end of the range, probably close to 70 Hz which is my preference. As far as the Phase and Slope, I left those basically in the middle of the dial for testing purposes. After a few test runs with music through my receiver from the local rock station, I was able to set the volume of the Nano 1 so that it appropriately increased and decreased in relation to the Artison Studio 46 speaker bar when the receiver volume was changed. As far as placement, where you put a subwoofer within a room is as important as the signal you put through it and the power within the amplifier. In addition to impacting the acoustics, it has ramifications from an aesthetics perspective as well, especially if you have a spouse that is very particular about what is or isn’t visible in your main home theater room. For my testing, I went with a corner setting in my lab, which provides two solid block walls to bounce the bass waves off of back into the room. Although the Nano has a very beefy 300 Watt amp, it is rated only down to 38 Hz on the low end, so any help in generating the bass acoustics was important to me. Aesthetics weren’t as important in this room for the review, but due to the small form factor the Nano 1 is essentially invisible sitting by itself off in the corner and would be in any room in your house. With the Nano 1 connected to my home theater system and placed in an optimal position in my room, it was time for testing its capabilities. The bass of a sub reacts specifically to the source that is encoded within the signal, so there isn’t a lot of variance except for the how deep on the audio scale the signal was encoded to go. Although I have broken out the testing by type of media being put through it, realistically the Nano 1 performed identically across everything I threw at it. Most of this performance can be credited to Artison’s Reactance Cancelling Configuration (RCC) vibration free technology that is utilized within the Nano 1. One thing I noticed is that with the RCC anti-vibration technology, the sub produces nothing more than bass. There wasn’t any ancillary noises (rattling, vibration, etc.) coming from the Nano 1 that you may get with a traditional sub without the technology so you only hear and feel clean, deep bass. My delta for comparison is my hi-end noise-cancelling headphones, which have a bottom frequency response of 8 Hz. I played through several movies, TV shows as well as live sporting events (via ESPN app and through DirecTV) and was very pleased with the sound. The Nano 1 added plenty of punch when necessary and didn’t distract from the overall enjoyment of what I was watching by adding any unnatural sound. Most of the sporting events and TV I watched didn’t push it to the lower levels of its limits, but several movie I tested it on most certainly did. In particular the movie ‘Fury’ really gave the Nano 1 a workout between the Tanks rumbling around and the fighting scenes. I also went with “The Incredibles”, which pushed the Nano hard through the various jungle and battle action. Last movie was ‘The A-Team’, which again had plenty of action to create a large testing sample. Not once did I feel like the Nano 1 was struggling to reproduce the soundtracks and the bass felt natural and blended seamlessly with Artison’s Studio 46 to create a fantastic sound field. When I started piping music through the system, it was clear that the Nano 1 was certainly able to handle anything that came across. I went with a nice blend of music genres, with a focus on R&B, Rap, Rock and Country with tracks that get into the low range of the frequency response. Specifically, I listened to Korn, Nelly, Jay-Z, Metallica, Phil Collins, Kid Rock and many others that I am well aware of how the deepest bass should sound when rendered properly. The Nano 1 never once disappointed me, as it reproduced the music as I expected with the tracks I chose for testing. It hit deep when it should have and kept up prolonged very clean sounding bass when the song called for it. In fact, many times the Nano 1 outperformed my primary home theater subwoofers I use (dual 8” ported subs powered by an external amp) in my gaming rig. While most gamers are happy to use their headsets, TV speakers or some sort of external audio system, many of them do not ever experience the full range of the game’s audio capabilities due to a lack of a quality subwoofer. Frankly, most gamers simply don’t realize just how much they are missing on the deep bass end of the games soundtrack that really adds to the gaming experience. Although I use subs in all of my gaming setups, I have never quite had one with the power and size combination of the Artison Nano 1. No matter what I was playing, the Nano 1 produced very tight bass that blended well with the audio coming from the game. The majority of the testing was conducted with Fallout 4, Rock Band 4 and various other titles. Fallout 4 offered the best overall test from my perspective, as the opening music sequence really comes alive with a good subwoofer and pretty much every action sequence challenges the low end of the audio spectrum. The opening piano track though went from sounding really good to having this absolutely rich and immersive range when the Nano 1 was utilized along with the Studio 46. With Rock Band 4, the game acts like music, as it reproduces the notes and will hit the same deep frequency that streaming the song would do. I played through quite a bit of songs, again with a focus on songs that had low frequency sections or notes. As with Fallout 4, the Nano 1 performed exceptionally in recreating the musical soundtrack from Rock Band 4. In addition, all of the other games I tested with I had the same experience, deep bass that tapped into areas of the game soundtrack that previously wasn’t accessible without the sub. As I stated above, you haven’t completely experienced a game until you unleash the lower frequency levels that the developers include. PC gamers that rely on headsets understand this, but console gamers rarely experience this unless they have invested into a quality sub for their home theater. Overall, the Nano 1 was exceptional with all of the audio testing that I put it through. Although it is listed with 32 Hz as its lowest frequency response, it certainly sounded like it was going deeper. I can only surmise that this was a combination of the positioning, RCC and the rigidness of the aluminum chassis. However, what I personally enjoyed was the fact that the Nano 1 produced exceptional sounding bass in the immediate listening area and didn’t shake the entire house. To me, this is more pleasing to the ear than also feeling my seat shake and everything that isn’t nailed down rattling around, which impacts the overall audio experience. 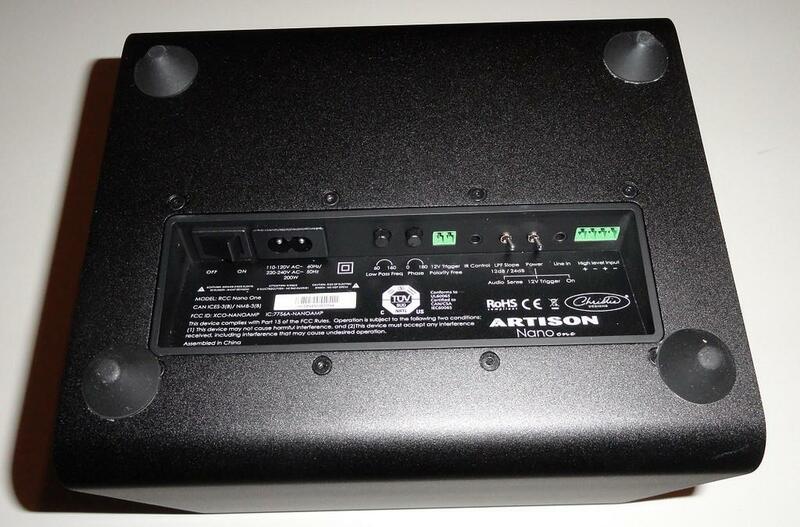 The Artison RCC Nano 1 is one of the best Subwoofers that I have ever used, especially when you consider its size. With Artison’s inclusion of multiple setting capabilities and the ability to add an optional wireless adapter, the Nano 1 is a perfect alternative for those that want to plug-and-play or fine-tune the sound to match your environment. During my time with the sub, the only negative I could find with it was during setup, when I had a bit of frustration trying to troubleshooting why it wasn’t producing any bass (factory set to zero volume). 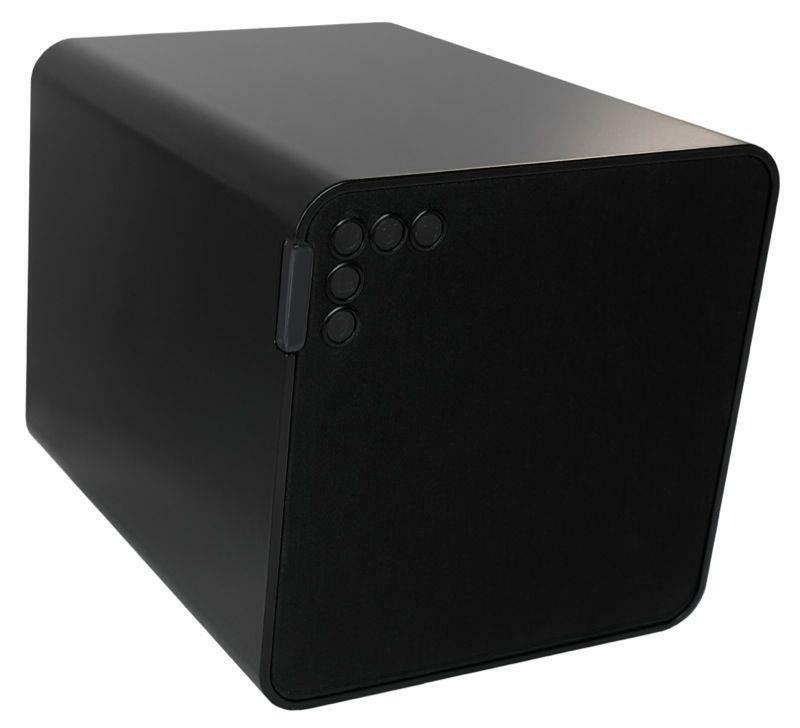 Although the Nano 1 is a bit on the pricey side for the everyday consumer at $999, it is a very elegantly designed high-performance subwoofer with a significant bass punch that will blend in with any setting with any type of audio input. 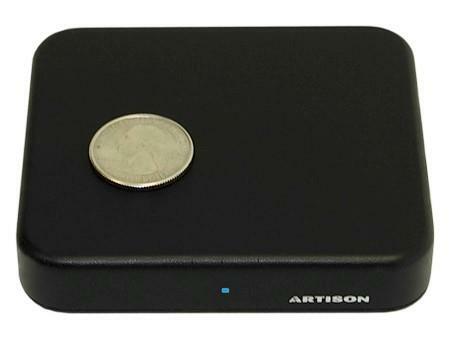 If it is within your budget, I would strongly recommend considering the Artison Nano 1 sub. The Artison Nano 1 has some of the best performance in a micro-sub that I have experienced. While the cost may seem a bit on the pricey side, it truly is a hi-fidelity product that performs within expectations for what it is being sold at. Other than a few moments of frustration during setup, there is simply nothing that is wrong with this subwoofer. The bass is crisp and clear, it responds wonderfully to whatever media type it being pushed through it and the small form-factor and stylish design allow you to put it anywhere in your listening area.